January in Utah can be pretty dreary. The weather is gray, gray, gray, every. single. day. So, to find some sort of sunshine in the gloom, here are two of my favorite things right now. I hope they make your day brighter and your load lighter. Dishes seem to appear out of thin air. It is still a mystery to me. Nevertheless, I feel like I am always doing dishes. This is only made more frustrating by lack luster scrub brushes. I like the kind that hold the soap. I have tried every brand made. Expensive, inexpensive, big and little. Brand name and no name. They have all adorned our kitchen sink. They all leak and the scrubbers always fall off. A few months ago my husband came home with a little gift for the household. Yep, it's a dish brush. This one made by Chef'n. I said thank you, but expressed my doubts. I was sure it would be just like all the others. ALL THE SOAP WAS STILL IN THE BRUSH. Every drop. Nothing had leaked out. Not one drop. It actually makes the dishes more fun to wash.
Easy to fill, the brush lasts forever, and it DOES NOT FALL OFF WITH USE. It screws on and stays put. It is not expensive and you can order it online. Plus, you can order replacement heads. We have also tried the foam heads. They are great, but over time the glue does weaken. I prefer the brush. It also comes in a great red color if you don't really like the green. Go ahead, give it a try. Is it pathetic that a good dish brush adds sunshine to my day? January leaves me wanting food that is lighter. After the holidays I am ready for something different. Wisk your oil and vinegar together until combined. Add the mustard, honey and green onions. It is not tricky. I usually put all the ingredients in together and wisk away. I double the dressing recipe when I make it. Cut up or tear your lettuce. Use your carrot peeler on your parmesan cheese to create long thin strips. and I like to use whole cashews. At home I put everything in a bowl and add the dressing. Toss and serve. When I am serving this for a more formal occasion, I like to make each salad on individual plates so everyone gets enough of the good stuff. (the pears, cashews and cheese.) Yum. Trust me, this will make your January less gloomy. Do you have a favorite "something" right now? Do Share. I didn't receive any compensation for recommending the dish brush. Chef'n has no idea who I am. I just really like it and wanted to share the great find with all of you. 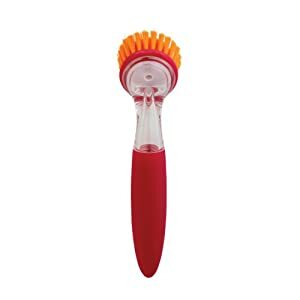 Funny that you wrote about scrub brushes - as dorky as it sounds, I just bought my first soap-dispensing brush in years and I love it! Every other one I've tried before has leaked too! This one is made by Oxo, it's a little palm held guy. The brustles are a bit stiffer than what I'm used to, but I have a cheapie 99 cent long-handled brush from Ikea for jobs that call for more gentle scrubbing. Very thoughtful of your husband! I am laughing Heather because my dang brush always leaks soap. I am snatching this one up right now! I have everything in my fridge for that salad so I'm going to make it in the morning. Thanks! The salad sounds delicious. Very nice. Light and crisp and perfect for January! Hope your gray days depart soon!